While SG-1 attends the execution of Ba[¬[al; the last of the Goa[¬[uld System Lords; Teal[¬[c and Vala inexplicably disappear into thin air. 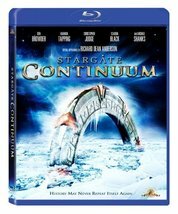 Carter; Daniel and Mitchell race back to a world where history has been changed: the Stargate program has been erased from the timeline. The remaining SG-1 members must find the Stargate and set things right before they world is enslaved by the Goa[¬[uld.